Jerusalem is a very popular attraction for tourists who want to explore the Holy Land and learn about Biblical sites and history- but it isn’t the only location in Israel with Biblical significance! In southern Israel, there are several locations where travelers will not only be awed by the region’s beauty, but also learn about life in cities and other locations mentioned in the Bible. With all there is to see and do in the modern cities of southern Israel and the historical sites to explore, it may be overwhelming to try and create an itinerary that includes everything you want to do during your visit to Israel. to find out how our expert travel agents can structure your trip to highlight the biblical sites of southern Israel. 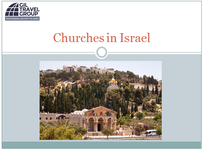 For more biblical sites in Israel, click below to download our guide to select churches off the beaten trail.